In this article, we propose a space–time adaptive processing scheme via a generalized sidelobe canceler (GSC) architecture for airborne multiple-input multiple-output (MIMO) radar. This scheme employs the waveforms extracted by the matched filter bank that is cascaded at the receive end and utilizes digital beamforming technique to synthesize a certain number of transmit–receive beams, therefore, the operation of target detection in clutter environment can be conducted in all the directions of the formed beams in parallel. 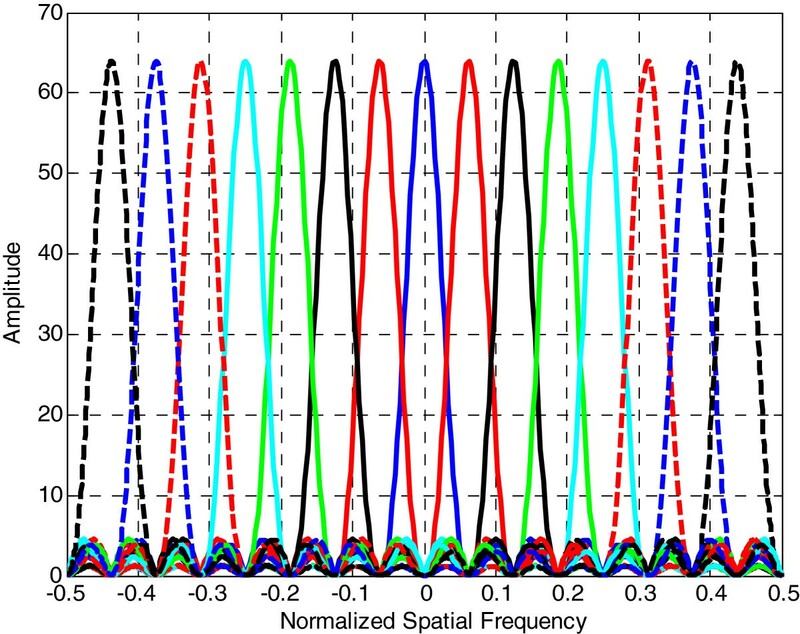 The GSC architecture is derived to implement adaptive reduced-rank (RR) clutter mitigation in a localized angle-Doppler space based on a novel RR multistage Wiener filter algorithm. The number of iterative stages in this algorithm is automatically selected in terms of a rank decision methodology. Meanwhile, beamforming and beam selecting methods are provided for this scheme, aiming at adaptively suppressing the clutter in localized domain. This scheme reverses the unavailability of the PA-efficient joint domain localized algorithm for MIMO radar. Moreover, it adapts to MIMO radar with arbitrary transmit–receive array space ratio. Even better, the proposed scheme has lower computation complexity than the traditional sample matrix inversion algorithm. The simulation results show that the proposed algorithm provide a signal-to-interference-plus-noise ratio improvement than traditional algorithms. Multiple-input multiple-output (MIMO) radar [1, 2] has become an active area of radar research and application in recent years. The basic concept of MIMO radar is that there exists multiple radiating and receiving sites. 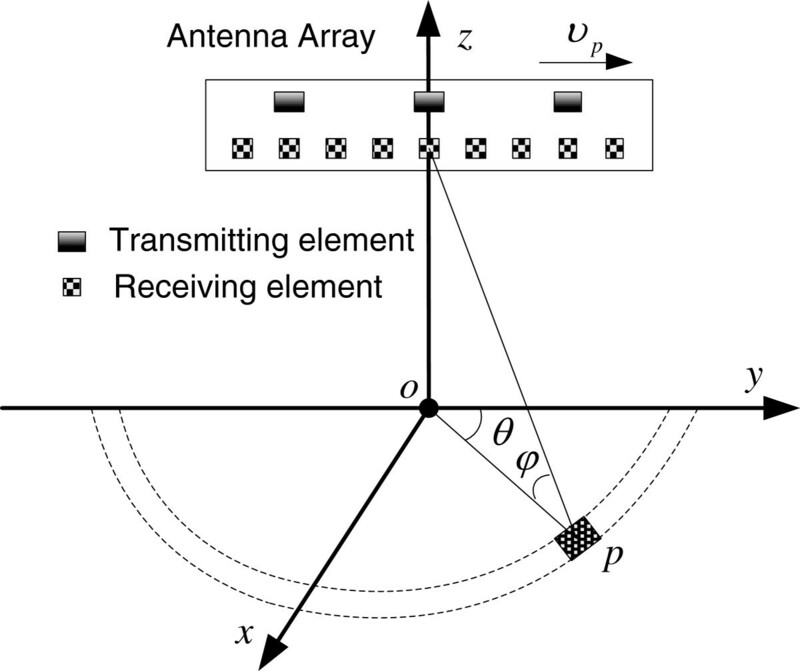 In current literature, MIMO radar is divided into two basic types: one is referred to as statistical MIMO radar in which the transmit/receive array elements are broadly spaced, providing independent scattering responses for each antenna pair; the other is referred to as coherent MIMO radar in which the transmit/receive array elements are closely spaced, assuming that the target is in the far field of the transmit–receive array. This article focuses on coherent MIMO radar and thus investigates the adaptive clutter mitigation performance. As a key enabling technique, space–time adaptive processing (STAP) technique for PA has been motivated for advanced airborne radar applications following the landmark publication by Brennan and Reed  and has reached a nearly mature height. In the past three decades, a large number of productive works have been done aiming at PA STAP [4–10]. It is well known that the essence of STAP is to adaptively adjust the two-dimensional space–time filter response to fully maximize output signal-to-interference-plus-noise ratio (SINR), and thus provide a better slow-moving target detection performance in strong clutter and jammer environment. The MIMO extension  of STAP has attracted increasing attention of researchers for MIMO STAP possesses the capability to assign transmit degrees of freedom (DOFs) into optimum processing including better clutter mitigation performance. However, the MIMO STAP can be more challenging owing to the extra DOFs produced by orthogonal transmitted waveforms. Inevitably, the rank of clutter and jammer subspace will increase and the STAP of MIMO radar will be more complex. When full adaptive processing is implemented, large computational complexity caused by the matrix inversion operation and the challenging number of training samples will prevent the practical implementation of STAP. This can be even more serious when the numbers of array elements and pulses in a coherent processing interval (CPI) are both large. Fortunately, reduced-dimension (RD) and reduced-rank (RR) STAP algorithms are able to relieve the heavy computational burden for MIMO radar while maintaining good performance. The key objective of RD/RR STAP is to reduce computational cost and thus improve statistical convergence. RD STAP cut back the adaptive DOFs physically by transformation that is data independent ; while RR STAP projects the received data into a lower dimensional subspace spanned by a set of basis vectors utilizing a data-dependent transformation. Multipath clutter mitigation for MIMO STAP radar can be found in . In , the MIMO radar clutter subspace was reconstructed with orthogonal prolate spheroidal wave function by fully utilizing the geometry of MIMO radar. Although it has lower computational complexity and formulates the data-independent clutter rank, it indeed depends too much on the ideal case and is not robust to the clutter mismatch. Current studies on MIMO STAP mainly focus on RR STAP [12–15]. In , a recursive least squares implementation is employed to calculate the transformation matrix and adaptive coefficients. In , clutter rank estimation was investigated with waveform diversity and it was derived that the clutter covariance matrix could be a function of waveform covariance matrix. In this article, we develop a new STAP scheme with a generalized sidelobe canceler (GSC) architecture. 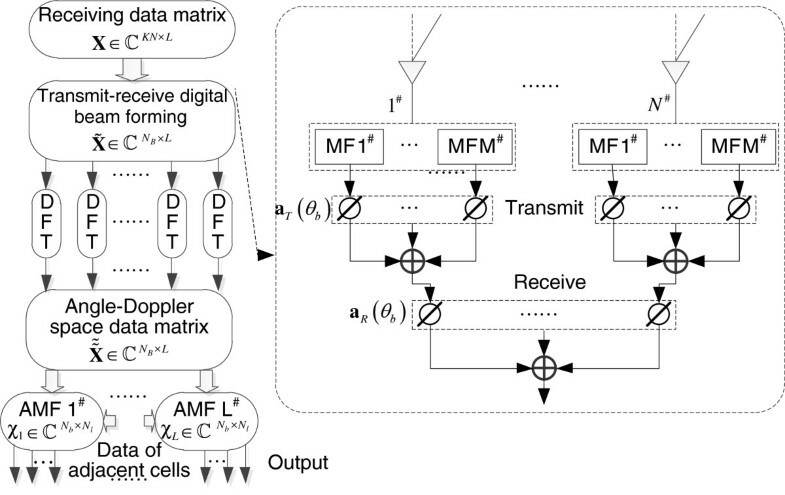 A RR multistage Wiener filter (MWF)-based algorithm is derived for this architecture, aiming at significantly reducing the computational burden of MIMO STAP. First, we exploit all the signals extracted by the matched filter (MF) bank to form a certain number of joint transmit–receive beams; Then the receiving data are projected into angle-Doppler domain, therefore, clutter mitigation and target detection can be conducted in all the directions of the synthesized beams in parallel. This scheme has reversed the impracticability of the noted JDL algorithm when applied to MIMO radar, and adapts to MIMO radar with arbitrary ratio of transmit and receive element space. This article is organized as follows. In Section 2, we formulate the generalized signal model of airborne MIMO radar with a sidelooking array configuration that is allowed to separate into subarrays. In Section 3, the beamforming-based modified joint domain localized (BBM-JDL) STAP scheme with a GSC architecture is proposed. The computation efficient RR MWF algorithm is derived in this section followed by the formulation of an AMF CFAR detector. Furthermore, the beamforming and beam selecting methods are proposed in this article, which are capable of promoting the performance of MIMO STAP. Some examples illustrating the comparative SINR performances of MIMO and PA radar are presented in Section 4. Finally, the conclusion is given in Section 5.
a k θ = 1 , e - j ψ T / P , … , e - j P - 1 ψ T / P T ∈ C P × 1 , k = 1 , 2 , … , K .
The geometry of MIMO STAP radar system. a T θ = 1 , e - j ψ T , … , e - j K - 1 ψ T T ∈ C K × 1 . C h θ = w ¯ 1 H a 1 θ … w ¯ K H a K θ T ∈ C K × 1 .
in which θ i denotes the azimuth of the i th clutter patch. MF bank should be employed at the receivers in order to get sufficient statistics. Hence, the clutter echoes for the l th pulse can be compressed by the matched signal matrix S ¯ . By stacking the compressed data into a columnwise vector with length KN × 1, we get the expression of c l as denoted in Equation (8) where R S ¯ = S ¯ H S ¯ and the notation Vec(·) means the stacking operation. C = ∑ i = 1 N c M K ξ θ i a R θ i ⊗ R S ¯ C h θ i ⊙ a T θ i a T f d θ i .
a f d θ = 1 , e - 2 π f d θ , … , e - 2 π L - 1 f d θ T .
D θ = a R θ ⊗ R S ¯ C h θ ⊙ a T θ a T f d θ . C = ∑ i = 1 N c M / K ξ θ i D θ i .
where β(θ t ) denotes the reflected coefficient of the target. R u = Ε x u x u H = R c + R j + R n .
where X u = C + J + N denotes the matrix form of x u which contains clutter C, jamming J, and noise component N in matrix form. It should be noted that the dimension of X, J, and N are the same as that of C.
The JDL-GLR algorithm proposed by Wang and Cai  is much more data efficient in the sense of fast convergence and requires fewer training data samples than other suboptimum STAP algorithms. This algorithm demonstrates constant false alarm rate characteristic and strong robustness. Straightforward application of JDL-GLR algorithm is no longer valid for MIMO radar. 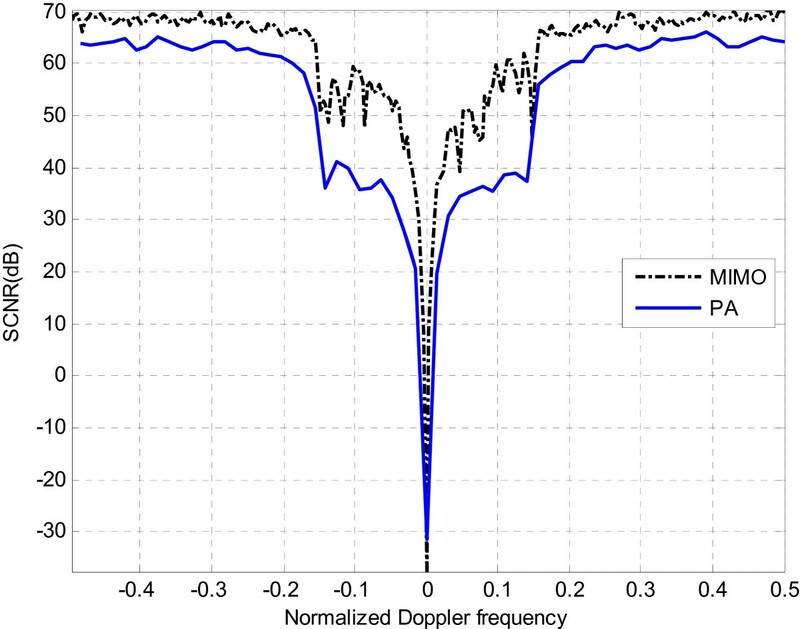 JDL algorithm transforms the receiving dataset to angle-Doppler domain by a two-dimensional discrete Fourier transform (DFT), which is efficient for PA radar because the spatial phase of PA radar is a uniform and linear growth process. However, the spatial phase of MIMO radar is neither uniform nor linear, especially when it does not meet the virtual array case. When FFT is operated to the receiving dataset of MIMO radar, it fails to transform to beam space. 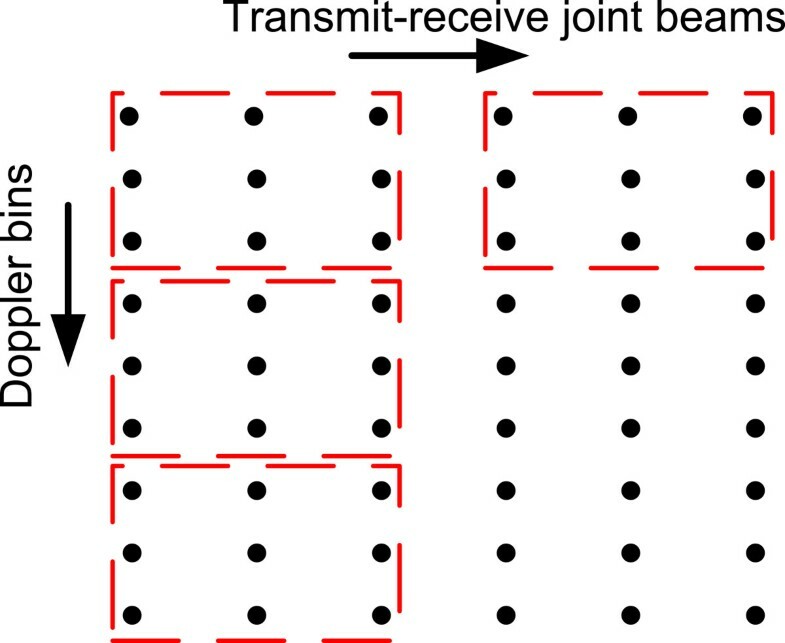 Joint transmit–receive beamforming can be a suitable way to settle the above-mentioned problem. We have extended our work  in this article. In this section, we propose the BBM-JDL STAP scheme with a classical GSC architecture. The joint transmit–receive digital beamforming-based STAP scheme is illustrated in Section 3.1. Section 3.2 derives the computation efficient RR MWF algorithm and formulates an AMF CFAR detector for this JDL scheme. The beamforming and beam selecting methods as well as some relevant analysis are provided in Section 3.3. We form a certain number of joint transmit–receive beams in the direction of radar search area, and then project the receiving data into angle-Doppler domain by a Fourier transform. After that the joint domain STAP and adaptive MF (AMF) CFAR test can be accomplished utilizing a GSC architecture. In contrast to the work in , which formulates the AMF CFAR test with an MWF structure and needs to construct blocking matrix when calculating the weighted value, we employ a simpler RR MWF algorithm with lattice structure. Target detection can be carried out in all the direction of the formed joint beams simultaneously. x i , n = x i , 1 , n , x i , 2 , n , … , x i , K , n T , i = 1 , 2 , … , L , and n = 1 , 2 , … , N .
Block diagram of BBM-JDL STAP processor for MIMO radar. where aT(θ b ) is expressed in Equation (5), θb is the azimuth of the b th desired beam, and N B is the number of beams to be synthesized in the direction of the coverage area. Note that ψ T in (5) actually is a function of azimuth θ and elevation angle φ. However, the value of elevation angle φ varies in different range bins. Consequently, it is not convenient to calculate this varying quantity when implementing beamforming. Considering that the elevation angles of the rang bins that are adjacent to the rang cell under test change slowly, thus φ can be ignored in (5) for both the transmit and the following receive beamforming. x ˜ i , b = x ˜ i , 1 , b , x ˜ i , 2 , b , … , x ˜ i , N , b T i = 1 , 2 , … , L . ; b = 1 , 2 , … , N B .
x ˜ ˜ i , b = x ˜ i , b H a R θ b i = 1 , 2 , … , L . ; b = 1 , 2 , … , N B .
x ˜ ˜ i , b = x i H a R θ b ⊗ a T θ b i = 1 , 2 , … , L . ; b = 1 , 2 , … , N B .
a R f s = 1 , e - j 2 π f s , … , e - j 2 π N - 1 f s T ∈ C N × 1 .
x ˜ ˜ i , b = x i H a R f s ⊗ a T γ f s i = 1 , 2 , … , L . ; b = 1 , 2 , … , N B . Second, a DFT is applied to each column of the beam-formed data matrix X ˜ ˜ , which transforms the receiving data to Doppler domain. Next, we follow the idea of JDL  to form a group of localized processing regions (LPRs) on the purpose of reducing the dimension of the receiving data matrix physically. Figure 3 illustrates the schematic diagram of LPRs. This scheme makes us to concentrate our attention on a small fraction of all the processing regions. Unlike , MIMO radar transmits low-gain wide beams because of the orthogonality of transmitting signals which cannot be stacked in homo-phase to synthesis high-gain narrow beams. Consequently, it is sensible to form multi-beams with high gain at the end of the receiver. The multi-beams cover the whole area where the wide transmitting beams reaches. 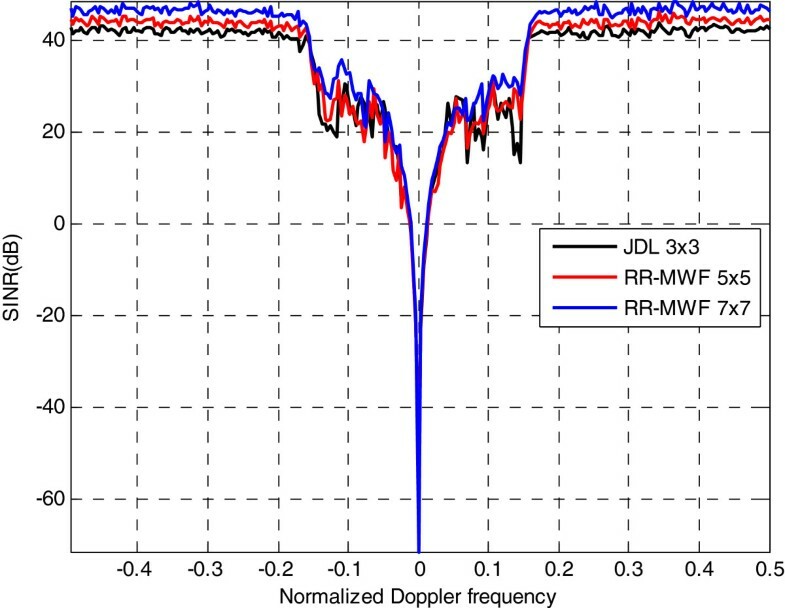 It is necessary to search in both the Doppler domain and the joint transmit–receive beam domain when detecting targets. Obviously, we can finish searching in the valid detectable area for few times. It should also be pointed out that the calculated amount of data processing in the LPR is much less than that of processing the entire receiving data matrix. Even though varieties of RD transformations can be applied to, the LPR processing is more superior for the size of LPR can be very small. Figure 4 illustrates a GSC structure which is applied to the LPR depicted in Figure 3. Let xLPR(n), n = 1, 2,… ,K be the data matrix of the LPR, and assume the size of xLPR(n) is N t × N s . Then we can filter out the desired signal d0(n), n = 1, 2,… ,K and the input data vector x0(n), n = 1, 2,… ,K from xLPR(n) by the steering vector s0 and transformation matrix T0, respectively. K is the data length. All the elements of s0 are equal to zero except the one being detected equal to 1, and all the elements of T0 are also equal to zero except the ones at the principal diagonal and the secondary diagonal. Assume the i th bin in the LPR is being detected, we can formulate s0 and T0 in Equations (28) and (29) where Ii–1 is a i – 1-dimensional identity matrix. Figure 5 shows the structure of the computation efficient MWF that is used to calculate the weighted value WGSC. This scheme entails block-oriented processing , but it avoids computation of blocking matrices and covariance matrix (for which there may not be sufficient sample support). To obtain stronger robustness and better performance, we modify this MWF structure to contain D iterative steps which is truncated at stage D when the norm of the previous error signals εD-1(n) is lower than the given threshold. The iterative processing steps are showed in Table 1. Computation efficient RR MWF with lattice structure. This scheme follows the idea of iterative correlating-subtracting, i.e., at each step, the correlated component is subtracted from the desired signals. The desired signal is updated by the remaining component after subtracting. It should be noted that the adaptive stopping stage D should be larger than the rank of the clutter in the current detecting LPR. When the size of LPR is selected, we can choose D adaptively according to the fixed threshold and the estimated rank of the clutter in the LPR. ψ 0 = σ d 0 2 - r x 0 d 0 H R x 0 - 1 r x 0 d 0 .
in which Q(·) is the incomplete gamma function. PA radar transmits identical waveforms at each transmit element, and these waveforms are reflected by the target located in far field with linear phase difference. Indeed, these echoes are superposed when they are received at the end of the receiving end. Utilizing the coherency of the reflecting echoes, a narrow and high-gain beam is formed when beamforming technique is applied. However, MIMO radar does not work that way. For the MIMO case, mutually orthogonal or non-coherent waveforms that cannot be stacked in homo-phase are transmitted, thus only wide low-gain beams can be synthesized at the transmitting end. In order to cover the whole area that the wide transmitting beams illuminate, multiple beams should be formed at the receiving end. However, the problems with this technique are that how many beams should be formed in the direction of the illuminated area for MIMO radar, and how should the synthesized beams be selected by the RR GSC architecture. For an airborne radar system with fixed configuration, the main lobe beam width of each synthesized beam is a fixed quantity (no windows) or larger than this fixed value (with windows). Thus, if there is no constraints on the number of beams, they will be seriously overlapped, leading to a strong correlation between the main and auxiliary beams. Moreover, large number of beams means that the frequency difference between neighbor beams exceeds the frequency resolution which is determined by the dimension of the spatial and temporal data. Consequently, when these overlapping beams are applied to the RR GSC architecture, perfect cancelation between the main beam and auxiliary beams will not be obtained because of failing to estimate an accurate clutter subspace. The number of the synthesized beams should be selected according to the dimension of the spatial and temporal data, in order to maintain the orthogonality of canceling beams. The beams that are adjacent to the main lobe should be selected, including the spatial and Doppler domains. More adjacent main lobe beams will achieve a good estimation of the clutter subspace in the joint domain. The position of the selected beams can be selected in a random form, on condition that the calculation load is acceptable. Figure 6 shows the synthesized multiple beam pattern utilizing sixteen transmit/receive elements (four uniform non-overlapped subarrays for transmitting). Assuming that the frequency has been normalized, thus we can only synthesize 15 orthogonal beams in the range of all direction. However, if the potential target is present in the direction between two neighbor beams in Figure 6, performance loss will occur because the main lobe of the synthesized beam is not at the direction of the target. An acceptable solution is to implement the same beamforming technique in the direction that is not illuminated, only to guarantee the performance loss that is less than 3 dB. Target detection can be conducted in the joint domain by selecting different canceling beams. Multiple joint beam pattern with sixteen transmit/receive elements (four uniform non-overlapped subarrays for transmitting). Note that one important aspect to fix attention is the differences in the noise power. The noise power after matched filtering for MIMO radar is K times that of PA which results that the signal-to-noise ratio (SNR) of PA is K times that of MIMO radar. To make up for this loss, MIMO radar should possess K times integration time than PA in order to guarantee a same force. In this section, we formulate the MIMO STAP problem. The goal of MIMO STAP is to maximize the SINR by combining the extracted signals separated by MFs so as to improve the slow-moving target detection performance eventually. R ^ l = 1 N R ∑ k = 1 N R Vec χ l , k Vec H χ l , k .
w l = R ^ l - 1 Vec S t l Vec H S t l R ^ l - 1 Vec S t l .
SINR l = w l H Vec S t l 2 w l H R ^ l w l .
In this section, we assess the proposed RD-RR STAP scheme utilizing simulated data. The parameters of the airborne radar platform are shown in Table 2. It is assumed that the receiving noise after matched filtering is Gaussian white noise whose power is calculated according to thermal noise. Constant gamma reflection coefficient model is employed when calculating the clutter of the airborne radar system. In the first experiment, we evaluate the SINR performance of PA and MIMO radar utilizing the proposed RR STAP. We divide the transmitting array into four subarrays which are 16 × 16 planar arrays for MIMO radar, and each subarray transmits an orthogonal waveform. For PA radar, there is no need to partition the transmitting array. The pulse number of PA is selected for MIMO radar to be 64, thus in order to maintain a fair comparison between PA and MIMO radar, 256 pulses should be selected for MIMO radar. The range of interest is 100 km, and the maximum operating range of the radar system is assumed to be 400 km. In this scenario, the range ambiguity is considered, and 100 range cells are employed when estimating the clutter covariance in each LPR. We also assume that channel mismatch is present with 5% amplitude error and 5° phase error. The amplitude error is assumed to be Gaussian distributed and the phase error is assumed to be uniformly distributed. The RCS of the potential target is assumed to be 5 m2. To obtain a performance comparison of PA and MIMO radar with this proposed RR GSC scheme, we choose the size of the LPR to be 3 × 3 for both systems. Figure 7 shows the output SINR performance of PA and MIMO radar in the abovementioned scenario. 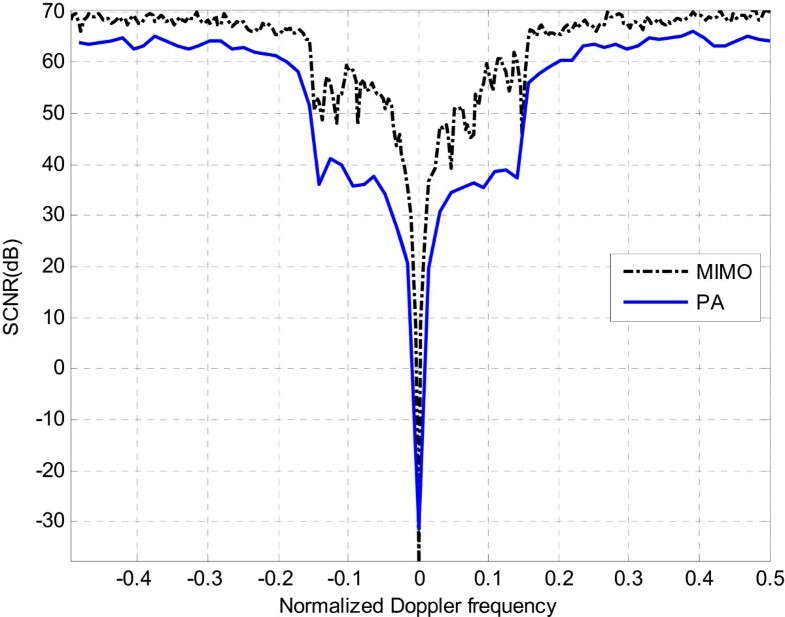 As depicted in Figure 7, the clutter is mainly located in the range of normalized Doppler frequency between -0.15 and 0.15, thus the output SINR performance of the high normalized Doppler frequency area is expected to reach to output SNR performance. However, because of the present channel mismatch, performance loss will occur in this scenario. This simulation result also shows that MIMO radar can achieve a higher SINR performance than PA radar in the context of channel mismatch. The reason of this result is that MIMO radar possesses more adaptive DOFs, which will fully process the clutter and noise component, even when the clutter environment is deteriorated. For PA radar, there are limited adaptive DOFs, resulting that the deteriorated clutter cannot be fully suppressed. It should be noted that in the main lobe clutter area, MIMO radar has shown obvious superiority for slow-moving target detection. MIMO radar can achieve a higher resolution than PA due to its long integration time. Output SINR performance of PA and MIMO radar for experiment 1. In the second experiment, we use the same parameters for MIMO radar system as the first experiment. We assess the performance of the proposed RR GSC processing scheme by comparing with traditional JDL method. Considering that the JDL algorithm employs matrix inversion when calculating the adaptive weights, heavy computation load will cost for JDL. While for the proposed RR GSC scheme, we only need limit steps of iteration to calculate the RR weights without performance loss. Thus, we can use a larger selected LPR size with 5 × 5 or 7 × 7 to maintain a calculation load which is close to JDL with 3 × 3. We do not provide a detailed computation burden comparison in this article. In fact, the computational amount of our proposed scheme with larger size is approximately in the same level of that for JDL with smaller size. As depicted in Figure 8, the proposed RR GSC scheme can achieve a 2–4-dB performance improvement than the traditional JDL with 3 × 3 LPR. This provides approach for us when large receive data size is to be processed. Output SINR performance of PA and MIMO radar for experiment 2. In this article, we devote ourselves to solving the invalidity problem of JDL algorithm when applied to MIMO STAP radar, and we have proposed an RR GSC processing scheme which makes full use of the extracted signals and forms some number of joint transmit–receive beams instead of implementing Fourier transformation. This scheme adapts to MIMO radar with arbitrary space ratio between transmitter and receiver elements. A GSC structure is used to detect target by employing an RR MWF algorithm. We have provided the beams selecting strategy for MIMO radar system with analysis and comparison with PA radar. Simulation results show that this scheme is valid for MIMO STAP radar by comparing the performances of PA and MIMO radar. It is also shown that, under the closely computation load condition, the proposed RR GSC scheme possesses superiority than the traditional JDL. Huiyong Li, Yongzhe Li contributed equally to this work. The authors Yongzhe Li and Huiyong Li are the co-first authors, and they contributed equally to this study. Yongzhe Li was supported by the Fundamental Research Funds for the Central Universities of China under Contract number ZYGX2010YB007, and by China Scholarship Council. Huiyong Li was supported by the China Postdoctoral Science Foundation under Contract number 2012M520077, and by the Fundamental Research Funds for the Central Universities of China under Contract number ZYGX2012J018.